Although the general population is aware of the health risks posed by food allergies, these risks are still a safety concern for the individuals affected. With no surefire method of detection, people with serious food allergies must avoid certain foods altogether; however, a project at the University of Guelph is increasing food safety by helping to detect allergens well before an item ends up on consumers’ plates. 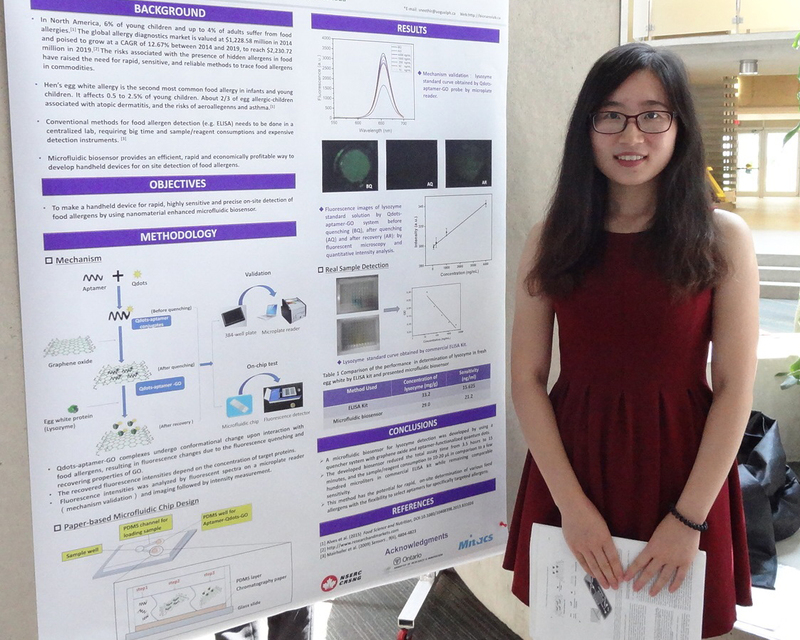 Kaidi Wang, a food science student at Zhejiang University in China, has travelled to Guelph this summer for a Globalink Research Internship that paired her with Dr. Suresh Neethirajan’s BioNano Laboratory. Kaidi’s internship has her working on a hand-held sensor that can detect common allergens such as brevetoxin and okadaic acid (from shellfish) and lysozymes (from egg) in food samples. “Food allergies have a significant effect on people’s health — and medical visits and treatments can be expensive,” Kaidi explains. “Previous methods to detect allergens were time-consuming and costly, while this method will provide easier, more affordable, and field-deployable detection.” Kaidi anticipates that the sensor will eventually be commercialized and used by consumers. The opportunity to come to Canada — which she learned about from classmates in China — has inspired Kaidi’s future plans: “I’d like to do a master’s degree and eventually a PhD abroad. I hope that I can return to Canada to continue my studies.” With Dr. Neethirajan’s support, Kaidi has broadened her research skills and even learned how to make a microfluidic biosensor chip. In addition, Mitacs is pleased to work with international partners to support Globalink, including Universities Australia; the China Scholarship Council; Campus France; India’s Ministry of Human Resource Development; Mexico’s Secretariat of Public Education, Monterrey Institute of Technology and Higher Education, and the National Autonomous University of Mexico; Saudi Arabia’s Ministry of Education; and Tunisia’s Ministry of Higher Education and Scientific Research and Mission Universitaire de Tunisie en Amerique du Nord.